Luckily, GoPros have a waterproof housing, proving that even if it rains you should still (and can) use your GoPro. So far, the 2015 holiday season, at least here in the South, has been a complete washout. Don’t get me wrong, Christmas Day was beautiful, but 75 degrees doesn’t really reflect the mood of all of the holiday songs you hear. Oh yeah, the washout part. If you’ve been watching your local news or the national news, you know that parts of Mississippi, Alabama, our home state of Georgia and the other Southern states have been inundated with rains and horrible weather. 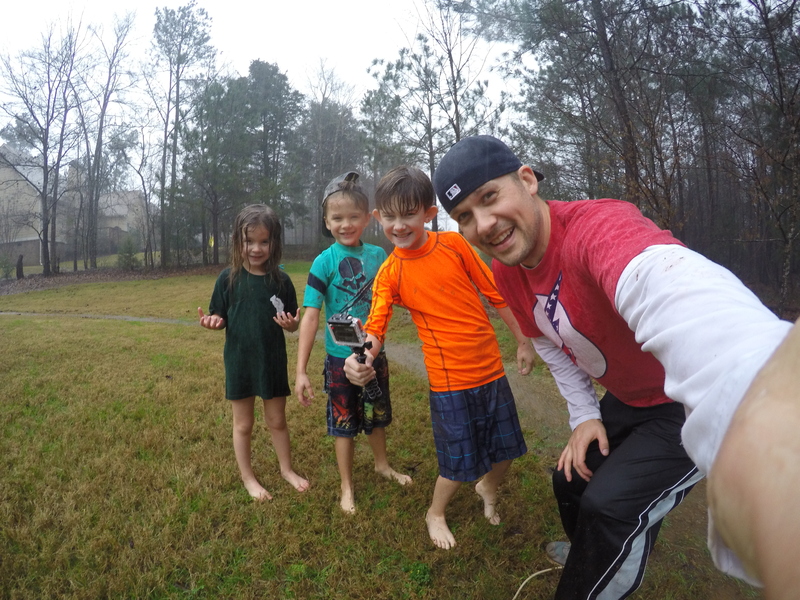 GoPro cameras give you a reason to get outside and brave the elements. Sure, these cameras are great on a beautiful day at the beach to capture waves crashing, surfing and family fun, but for my family and me, it’s days like the one we’re having today where our GoPros help us make awesome memories. The operative word in this heading is “brave”. Under no circumstances would I be out in a deluge of rain if it weren’t for these contributing factors. The kids are home on Christmas break, we’ve felt kind of stuck in the house quite a bit due to the bad weather and we all needed to let off some steam. If you’re anything like me, one who likes to make short films and document everything that my family and my clients do, when you go for a stretch of time without producing content, you get an itchy trigger finger. My middle son knows my hot buttons and casually mentioned that it was raining so hard that we could probably grab the boogie board from the garage and go sledding in the rain. That was all I needed to get my wheels spinning. What I’m thinking about when I decide to shoot a video like this. I have two GoPros. There is a Hero3 Black edition and my newest one, the Hero4 Silver edition. I used my Hero4 as my main camera for our pictures and on the front of the board for this shoot. The Hero4 is the only GoPro camera at this time that has a visual display on the back. This is key to framing shots. Even though the FOV (Field of View) on these cameras is 170 degrees, you’d be surprised how easy it is to cut off a head or miss parts of your shot without it. I guess you could say it becomes a crutch. But it’s their most user friendly camera by far. As a side, I have been asked by many clients and friends who are thinking about jumping into the world of these action cameras of which GoPro to purchase and I think you know what I tell them. Get the Hero4 Silver edition. It’s the best $400 you’ll ever spend. Another benefit of having the Hero4 Silver edition is that it will allow you to shoot in 120 fps slow motion. Why is this important? Well, when you are moving quickly, as the kids are on their boards, often times, such as in the final edit of this video, it adds depth to the final cut to slow it down for the real action. The splashing of the face with water droplets – Falling off the board and rolling over. The only downside to going this route (and this is nitpicking) is that the resolution is degraded down from 1080p to 720p. Not a terrible trade off because both are considered HD, it’s just that 720 has a fewer overall pixels. So I had my main camera (the Hero4) attached via the clamp attachment to the boogie board itself. My Hero3 was stationed on a Joby Gorillapod for ease of movement, positioning and for one of my kids to hold, which you will see at the end of the video as I was able to piece together two angles of the same shot. I try to get as creative as possible and also grab as many B-roll type shots to help supplement my shots. For this video, we were outside for about 30 minutes shooting and running with the board nonstop. I can tell you from experience. No matter how careful and thoughtful you are in your angles and what you get on camera, after you sit down and look at your footage, you’ll wish you had that one extra clip. It happened on this one. What do I wish I would have captured more of? I think some static shots of the kids high-fiving, waving or splashing would have been awesome. But, you live and learn, plus you have to be aware that working with three kids, your interpretation and their interpretation of what you need to accomplish is completely different. They’re out there for one reason and one reason only. To Have Fun. And, boy did they. I’m sure I could write an entire series of blog posts on editing. Really, truly my best advice to you is if you’re interested in creating fun and amazing videos, just practice. This is what I’ve done for over ten years now. I’m completely self-taught and continue to learn and try new things. The idea of sitting down and reading a manual, taking a class or anything like that goes against how I learn. I have to do it. That is my recommendation to you. Download iMovie from the iOS app store (there’s an iPhone, iPad and Mac version) and get started playing around with the settings and import/export process. I will say there are some great YouTube videos to learn from if you just want to type in iMovie. If you’re not into iMovie, the only other editing app for beginners that I would recommend would be Cameo, which is powered by Vimeo. It is for iPhone only thus far, but the simplistic editing software combined with a multitude of song choices and filters can make even a one shot video look professional. Again, this could be a topic that I could write a couple of blog posts on, but the main place you should share your video (if you want to have it seen by anyone) is YouTube. I suppose I should take my own advice on this and put more of my videos on YouTube, but I primarily choose to utilize Vimeo for my video hosting. I like it because it looks and feels professional, meaning no ads, but there’s a natural give and take. When people or companies are searching for videos, where do they go? They go to YouTube. One final bit of information on the sharing process. Have you thought to share your video directly to Facebook? That is what I’m going to be focusing on in 2016. Whether I place my video natively on YouTube, Vimeo or both, I will be certain to upload it natively to Facebook. The targeting and ad platforms on the site are second to none and if you want your story or brand or simply your family video to be seen, Facebook is where its at. Don’t get confused, I didn’t say link your video to Facebook, I said to natively upload it to Facebook. You know, the kind of videos that auto play. Why? YouTube is owned by Google. You think Facebook wants to drive traffic away by ranking your post higher and thus send you to its competitor? No way. GoPros open up a band new world to the dad, mom, small business owner or student who wants a camera that will allow them to capture a unique perspective of their lives or company. You don’t have to be jumping off cliffs into the lake to justify getting one of these gems of a camera (although it can’t hurt…shameless video plug here), GoPros can be the perfect solution to cabin fever during the holidays by putting your creative side on display. Plus, you’re kids will think you’re awesome all over again. The author of this article is Scott Duvall. Scott specializes in video marketing through the use of iPhones and GoPros. If this is something you have been interested in, but just don’t know where to start, feel free to reach out. Email is the best way to get in touch.